Microsoft foolishly removed the standard "Start Menu" from their newest operating system and has users up in arms because of it. 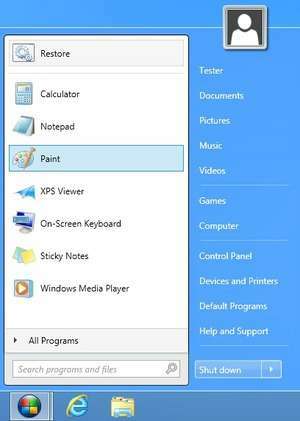 Windows8Starter is an option which re-adds the Start Menu to your Windows desktop and includes much of what users became used to in Windows 7, Vista, XP and even Windows 95. The new Start Menu includes links to documents, libraries, shut down, restart, etc. Virtually everything which existed in Windows 7 can now be restored in Windows 8 with Win8Starter. For security reasons, you should also check out the Win8Starter download at LO4D.com which includes virus and malware tests. Additional screenshots of this application download may be available, too.